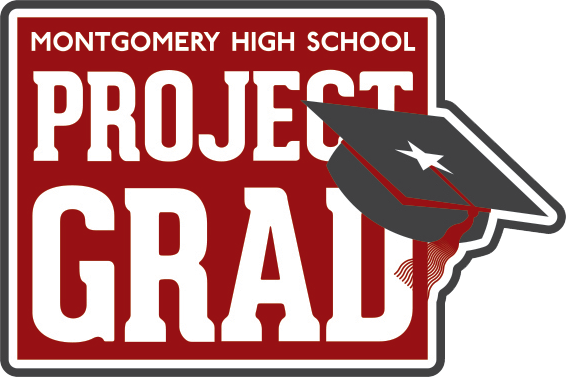 Project Graduation is a non-profit organization that provides an all-night party for the senior class of Montgomery High with the goal of keeping graduates safe and off the roads on graduation night. It is a drug-free and alcohol-free event and gives graduates one last chance to socialize together as a class. Since Project Grad's inception in 1988 there have been NO fatalities on Grad Night in Sonoma County! Project Grad Party Rules: Admission is granted to MHS Seniors only who have prepurchased ticket AND have submitted a signed release of liability form by a parent or guardian. This is a drug and alcohol- free event and is NOT permitted. Your party begins at 8:30pm and NO ONE will be admitted after 9:45PM. Your party ends at 4:00 AM. Seniors leaving the party before 4AM will not be readmitted- No in and out to your car. Seniors leaving the party before 4AM will only be permitted to leave with their parent or guardian regardless of being age 18. Parents of seniors that have purchased tickets that don't attend the party will be notified sometime after 10:30pm. You must be present to win prizes. Purchase your Project Grad Tickets NOW! Fundraising: LOVE YOUR VIKING February Fundraiser needs at least $10 from EVERY viking family. This can offset our costs not recovered from ticket sales alone. Please donate cash or prizes to kickstart our Grad Night party planning. Please use the donation button on the top right. Gold Level Sponsor $2500+ donation - Your name or business name will be featured on a professional vinyl banner displayed at the graduation ceremony and project grad. Additionally, your name or business name will be listed on the official Project Grad website. Silver Level Sponsor $1000+ donation - Your name or business name will be prominently displayed on a professional vinyl banner at the graduation ceremony and at project grad. Bronze Level Sponsor $500+ donation - Your name or business name will be displayed on a professional vinyl banner at the graduation ceremony and project grad. Friend of Project Grad $60 donation - Provides a scholarship for one senior's project grad ticket. Volunteer Opportunities- Click here to go to our SignUpGenius to view all our volunteer opportunities. We need 250 volunteers to work a few hours to make this event happen. Select one or more Volunteer areas and we will contact you. You may check more than one box if you have multiple students at MHS. Please let us know if you have any skills, schedule requirements, or comments to further assist us in utilizing your much appreciated support.